Have you been to one of George's classes? He knows how to bring the outdoors indoors. We wanted to share more about him so we did a little Q and A to get to know his personality and teaching style! In addition to teaching cycling classes at the DAHLC, George is a mountain biker. Other favorite summer activities include landscaping and spending time with friends. 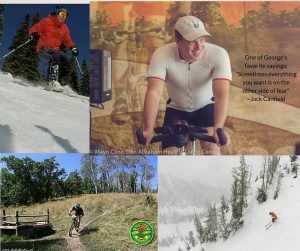 And as shown by some of the photographs, George is an avid skier. When asked what excites him about working at the DAHLC, George said "The quality - from the facilities to the staff, everything is top notch". *What's always in your fridge:" fresh fruit, veggies, orange juice, eggs, yogurt"
*What was the last book you read: "The Road to Character by David Brooks"
*One thing from your bucket list includes: "I don't really have a bucket list - I probably should create one." When George was asked how to define wellness, he said "Wellness is the entire package: physical health, emotional health, mental health." Be sure to check out George's classes on Tuesday nights in the cycle studio at 5:30pm and he also rotates at 7:15am Indo-Row class on Saturday mornings. Click here to see the class schedule. Thanks for letting us get to know you better, George!